The struggle is real, as students say these days. In fact, the struggle is real for students – the struggle to pay for college, that is. Students and families face significant challenges to find funding for college as costs continue to increase. But did you know, after putting together the plan to finance their education, more than half of the student respondents of a recent nationwide survey reported that they take on even more of the burden of paying for their education than originally anticipated. In most cases these students are covering at least 50 percent of the total cost. 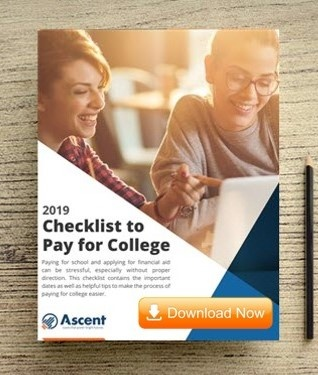 The survey, conducted by Ascent Student Loans in May 2018, provides valuable insights on students’ financial aid plans for this coming school year. But as the current finance environment continues to frustrate students, is there a way to decrease the frustration toward paying for college, mitigate the struggle to find financing and lower the apprehension around the long-term impact of today’s financial decisions? We need transparency in student lending, including helping borrowers understand what options are available to them. Private loan administrators have the flexibility to shift the industry culture, which is exactly what the Ascent Student Loans program has done. The Ascent program is guided by a focus on transparency, financial education and student outcomes, working with students and families to view college and evaluate their financial aid options as an investment, not an expenditure. Further, Ascent is the only student loan provider that incorporates financial education into the application process and requires all students and cosigners to complete a financial literacy module before approving loans. The Ascent Tuition loan can be considered for students with a creditworthy cosigner, though an existing challenge for many students is finding finance needs when they lack a qualified cosigner. When undergraduate students exhaust traditional loan options, either hitting federal loan caps or losing the support of a parent cosigner, they are left with few alternatives. Consider the up-hill challenge these students are presented with when trying to piece together their financial aid: third-year undergraduates able to borrow $12,500 in maximum federal aid, yet are left with an $8,000 funding gap if attending public school and a $43,000 gap if attending a private institution.1,2 Students who have exhausted their eligibility of federal aid are at an even greater disadvantage. The lack of financial support can impair the probability of the student graduating. The top reason for students leaving college is the need to go to work to make money (54 percent).3 If a student has the desire to pursue advance education, they shouldn’t be blocked by financial barriers. It’s time the industry took a different approach to supporting these independent students, and that solution is Ascent Independent. The Ascent Independent loan supports full-time junior and senior students at 1,800+ schools throughout the U.S. The Ascent Independent loan was developed specifically to meet the financial challenges felt by this contingent of students. The program considers a holistic look at the student’s creditworthiness, as well as how their school, program of study and major, cost and graduation date may impact the loan after graduation. The Ascent Student Loan program is the only national lender offering students a non-cosigner loan option, and works hand-in-hand with students through the process by countering offers with lower amounts, as needed. This approach to lending seeks to address the difficult financial situations currently facing students and their families. Through Ascent Tuition and Ascent Independent, students are provided options to close financial funding gaps and focus on the important academic year ahead. 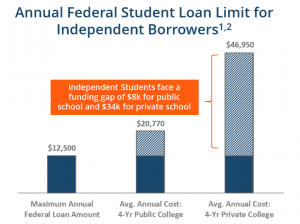 1 U.S. Department of Education – Independent students (and dependent undergraduate students whose parents are unable to obtain PLUS Loans) can borrower up to $9,500 as a first-year undergraduate, $10,500 as a second-year undergraduate, and $12,500 third-year undergraduate and beyond for a total amount not exceed $57,000. 2 College Board, “Trends in Student Aid 2017”, Average cost of attendance includes: tuition, fees, room and board and costs are in 2017 dollars.